Legalising documents with the apostille in just 1 to 2 days. We hand process documents with the FCO to obtain the apostille while keeping your documents safe. Our dedicated apostille and embassy service will ensure your documents are correctly legalised for use outside of the UK. Our apostille service makes legalising documents simple. We ensure your document is suitable for legalisation and provide solicitor certification for documents when required. We ensure the apostille certificate is attached correctly so that it will be accepted when presented in another country. Our inclusive service takes care of solicitor certification and the UK apostille so you do not need to waste time and money locating solicitors and paying high fees. Order online securely and order your apostille today. How Do We Process Documents? All documents are checked to make sure they are OK for the UK apostille. Do not worry, we will let you know if there is a problem. 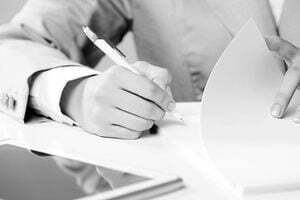 Some documents need to be signed by our solicitor before the apostille is issued. On completion we will return the document by your requested method with the apostille attached. What Does The Apostille Look Like? In the UK, the apostille is a certificate made of paper that is glued to the back of another document. It is then embossed with a government seal. All legalised documents must be signed by an official with high enough standing, a solicitor, a notary public or it must be stamped by a government office. Using a professional apostille service ensures documents are correctly legalised. 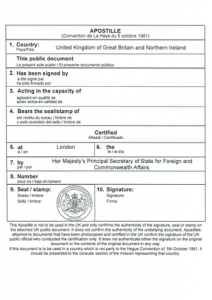 Our service includes document checks, solicitor certification and the UK apostille. It is considerably quicker and often cheaper than trying to arrange this yourself.